HKK has been in operation for more than 30 years and has over 2,000 students in more than 50 clubs. We are a founder member of the English Karate Governing Body and recognised by the European Karate Federation and the World Karate Federation, and are members of the World Karate Confederation. 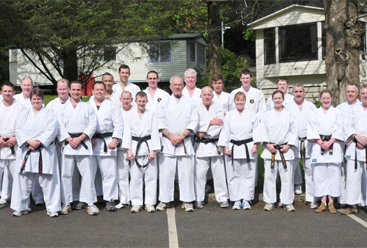 The style of karate we practice has its origins in the Wado Ryu system and has been developed and enhanced over the years under the guidance of our renowned Chief Instructor – Peter Spanton. Peter Spanton is the Chief Instructor of the Higashi Karate Kai – our parent association – which covers many areas in the U.K. and even some exotic locations overseas! We have clubs in an area stretching North from London to Stafford, West to Somerset and South to Jersey, as well as affiliated clubs in Northern Ireland, Eire, Wales and Australia. Our traditional style of Karate is Wado-ryu, on which our modern style of Higashi is based. We hold three National competitions a year of our own and participate in various National and International events whenever possible. Higashi have a fine record of achievements at National and International level. HKK began life in 1968 when a handful of clubs, Forest Gate, Cheltenham, Cardiff and Bristol, decided to get together occasionally to train. They were at the time members of the British Karate Association. A year or so earlier, the BKA had a split with the Japanese instructors, and were using their own highest graded people as instructors. The four clubs met on a regular basis for training and the occasional friendly competition. Within a year or so, several more clubs had joined our little group, which by now had been given the name of Higashi Karate Kai and had decided on a dragon for it’s logo. By 1977, the HKK group had grown to 27 clubs, and it was at this time that at a meeting of club heads, we decided to leave the BKA and set up as a federation in our own right. We have never looked back, and since then have operated as a successful federation, or family as many of us consider ourselves. We are highly respected in the British karate community and have made many friends, in different styles and federations, both home and abroad. As previously mentioned, our traditional style is Wado-ryu, however we have evolved slightly with some Higashi katas and many different training routines. We even occasionally practise some katas of other styles, however, these particular katas are not in our syllabus, and nor are they used in our competiton. They are optional to our members to expand their knowlege. Such is our way of thinking. All styles have something to offer!